Happy International Women’s Day! We're so excited to announce that our latest book, Be the Change: The Future is in Your Hands, is officially LIVE today! We created Be the Change to give young people—especially girls—the tools to use their creativity to turn their values, dreams, and hopes for their communities into tangible action for change. Be the Change is inspired by our confidence in young people to make a difference, evidenced by the current groundswell of powerful teen activism. Be the Change inspires youth to use their creativity to connect, unify and amplify their change actions to create a better world. As teens, we didn’t realize the power of our own creative voices, and we didn’t see a connection between creativity and social impact. At the Women’s March on Washington, we woke up. Those creative protest posters, songs, and speeches MADE the march! Be the Change draws on our years of experience as creatives, activists, and leaders. We cover what it means to be the change from within, what it means to be creative (it's not just being good at art! ), and how to turn inspiration into action. 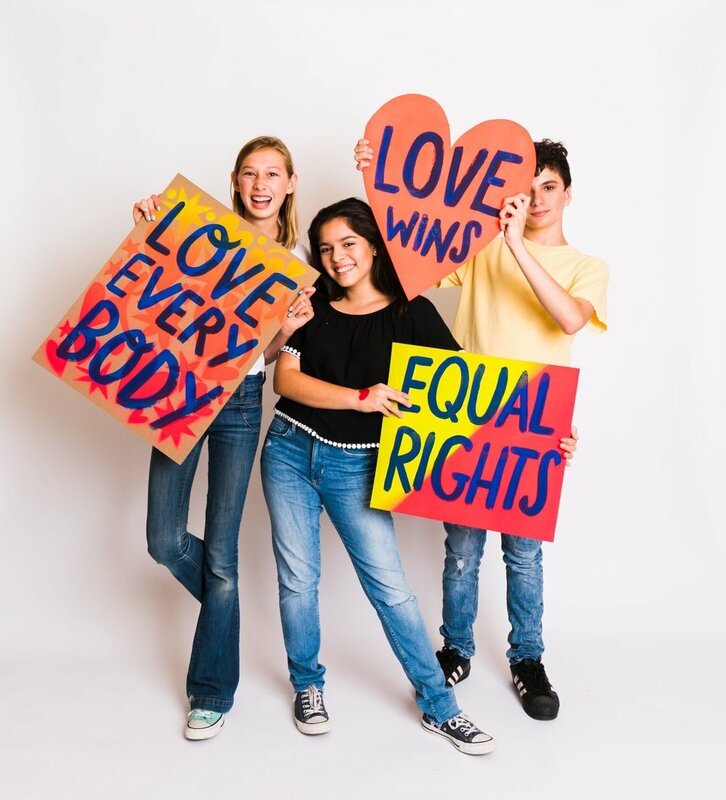 We also provide 16+ fun, easy, hands-on projects for everything from t-shirts to protest posters, bumper stickers, fundraiser invitations, and campaign posters to run for student office! You can pick up a copy at Amazon, Barnes & Noble, Indie Bound, Chapters, or your local bookseller. Or get a signed copy here or on Tuesday, March 13 at our all-ages launch party, featuring letterpress demo, author talk, protest poster making for the National School Walkout on March 14 and much more. Can't make it? Try to pop into any Ritual Coffee location in San Francisco this week to pick up a copy of Be The Change, and enjoy coffee out of our limited run Stay Woke cups! A portion of proceeds from Be the Change will be donated to WE Schools, part of the WE movement, which empowers young people to take action on local and global issues that spark their passion and gives them the tools to make a difference. Be sure to head over to the Be the Change website if you want more information about the book.